Alderleaf offers a variety of wilderness survival courses. Learn outdoor survival skills, bushcraft, primitive skills, and self sufficiency. Choose from weekend classes, week-long courses, nine-month training programs, or an online course. Alderleaf teaches both primitive and modern wilderness survival skills that empower people to be prepared and at home in the outdoors. Weekend Wilderness Survival Course - Learn the most important skills for survival: shelter, water, fire and food. Gain practical, hands-on experience. Essential Wilderness Survival Skills (Online Course) - Learn the core skills of survival in a format that allows you to participate at your own pace. 5-Day Wilderness Survival Skills Intensive - Spend five full days immersed in studying outdoor survival skills. Detailed instruction and hands-on practice. Nine-Month Alderleaf Wilderness Certification Program - Our most comprehensive course. Training in survival, nature skills, and sustainability. Nine-Month Advanced Wilderness Skills Program - A second year of advanced nature and survival training for Certification Program graduates. Weekend Primitive Hunting Tools Course - Learn how to build an atlatl, bola, rabbit stick, sling, and quickie survival bow at this course. Weekend Survival & Tracking for Hunters - Learn wilderness survival and wildlife tracking skills specifically applicable to hunting. Weekend Flintknapping Course - Learn how to make spear points, arrow points, knives, and a variety of other stone tools using obsidian. 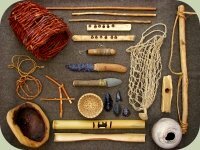 3-Day Bow Making Course - Learn how to make a wooden long bow. Build and take home a bow, an arrow, and the skills to make more. Weekend Knife Making Course - Forge your own knife while learning about steel selection, basic metallurgy, profiling, heat‐treating, grinding, and more. 1-Day Survival Fire Making Skills Class - Learn how to create fire with natural materials. Gain experience with bow drill, hand drill, and flint & steel. Weekend Overnight Survival Course - Learn more survival skills and put them to practice in a guided overnight survival experience. 3-Day Brain Tanning Course - Learn how to turn animal hides into beautiful brain-tanned leather for clothing and survival projects. Weekend Axe Forging Course - Learn basic metallurgy, forging, heat treating, and hafting while you produce a backcountry axe to take home. Weekend Arrow Making Course - Learn about forging arrowheads, shafting materials, hafting, cutting self nocks, fletching, and more. Online registration is available for many of our wilderness courses. Visit the Course Registration page to sign up for classes. Discounts for our Wilderness Survival Courses - Receive 10% Off! 3. Multiple Class Discount: Register for more than one class at the same time and receive a 10% discount. new wilderness courses and nature skills articles. For information on other wilderness survival schools around the world, visit wilderness-survival-skills.com.